Recently I read Rachel’s blog entry: “The new bizarre online fad” that talks about Chatroulette. This website that pairs random strangers for webcam-based conversations seems to me very interesting and scary at the same time. Even though I am not willing to give it a try yet I was wondering if Foursquare can work for both people and businesses, could Chatroulette also work for companies? I found an article on Inc.com that talked about companies that were using Chatroulette to advertise their products. I am not sure how this exactly works or if it works for all products but I guess we have to know what is going on out there and how companies are using these new tools to communicate with their customers. 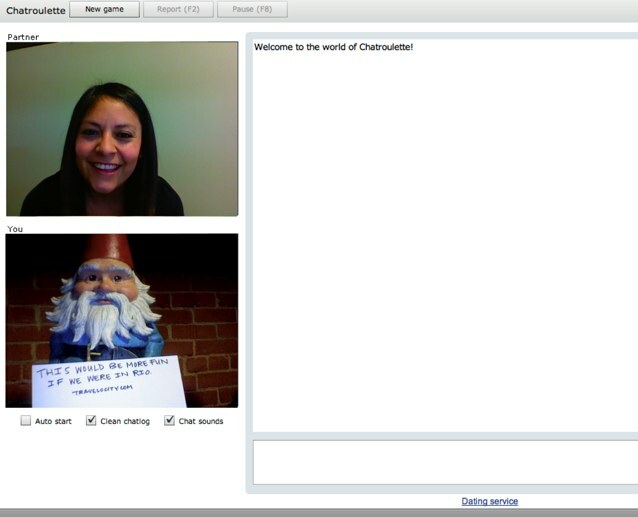 For example, Travelocity has entered the Chatroulette world with their iconic Roaming Gnome which appears holding a variety of signs throughout the day with messages such as “This would be better if we were in Rio.” The goal is to motivate video chatters to step away from their webcams and take vacations. It would be interesting if we could see some results from this campaign and if in fact it generated more sales due to its pressence on Chatroulette. Facebook Fan Pages (Part2) Your table is ready!